Our shirts are available in both men's and women's cuts and in a variety of colors. 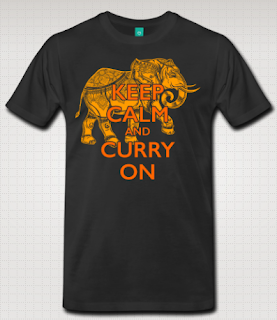 Get yours today in our T-shirt shop! This rich, spicy recipe (meaning “King’s Dish”) will transport your taste buds straight to India. Fry shallots, ginger, and garlic in oil until they become slightly brown. Mix salt and spices with a little bit of water to make a paste out of the spices. Fry the spice paste with the other ingredients until they become thick like a gravy or paste. Add the butter and heavy cream to the other ingredients. Cook until the oil starts to separate from the other ingredients. Add the tomato paste and mix thoroughly. Add meat or paneer and stir frequently until cooked. If you don't want this recipe to be spicy hot, simply leave out the chile powder. You will still have a very tasty meal that everyone can enjoy. To make this recipe extremely spicy, we encourage you to try adding dried Bhut Jolokia chiles or fresh Dallay Khorsani while you cook. We also like to serve Dallay Khorsani Pickles on the side. 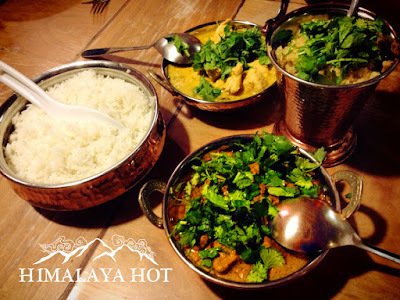 If you enjoy this Maharaja Curry recipe, be sure to check out all of our other spicy Himalayan recipes here. This is an easy way to make jalapeño poppers (stuffed peppers), but you’ll find it to be quicker and tastier than most others you’ve had before. If you have more time, be sure to check out our recipe for Epic Bacon Wrapped Jalapeño Poppers. 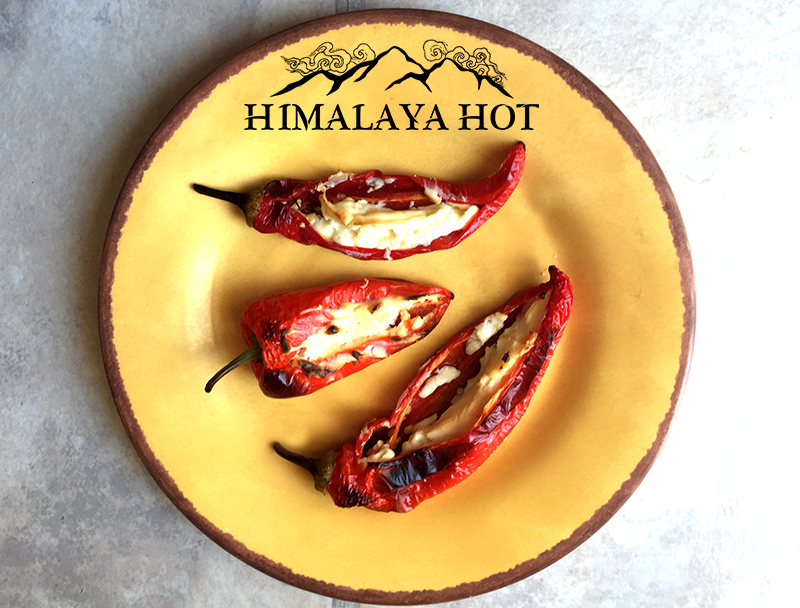 Three different varieties of our chiles stuffed with cheese = Delicious! Preheat oven to 325° (Fahrenheit) and let cream cheese sit out at room temperature. In a pan, fry the bacon and set aside to cool. Fry the mushrooms in the bacon grease for about 1-2 minutes on high heat. Add the garlic and fry for 1 more minute. Slice the jalapeños in half. Fill each half with a generous mound of the cheesy mixture. Place on a baking pan, with the cheese side facing up, and bake at 325° (Fahrenheit) for 15 minutes. For less spice: If you are serving guests who are not able to eat very spicy foods, we recommend scraping out the seeds and the white-ish membrane covering the inside walls of the peppers before cooking. This will significantly reduce the heat level. You might also consider using a milder type of chile, such as an Anaheim, Poblano, or a no-heat varities of sweet peppers and bell peppers. For more spice: Try making the same recipe with a hotter type of chile, such as a habanero. Also, consider adding powder from spicier chiles into the cheese mixture. Put the cream cheese and other cheeses in a large mixing bowl. Let it sit out in room temperature so that the cream cheese softens slightly while you make other preparations. Melt butter in a pan, and fry the garlic in the butter until fragrant and lightly browned. Pour the hot butter and garlic in with the cheese and mix thoroughly. Stuff the peppers with the cheese mixture as full as possible. Finally, cut a piece of mushroom to stuff into the end of the whole in the pepper. This will help prevent the cheese from leaking out when you cook the poppers. Wrap each jalapeño in one whole piece of bacon. We highly recommend maple bacon, but any bacon will work. Be sure that you cover the sliced end of the pepper so that all of that cheese stays inside! Wrap the bacon in such a way that you can “tuck” the end back under itself so that the bacon won’t unravel. If your peppers are especially large, you may choose to wrap them in two pieces of bacon. Place the bacon-wrapped peppers on your grill or in your oven. Turn them as necessary, and take them out once the bacon is fully cooked. Very important: Let the poppers cool for at least 10 minutes. The inside is filled with boiling hot cheese, and you will scorch your mouth badly if you bite in too soon. You can use any chile peppers with this recipe. Jalapeños are the most popular for poppers in the USA, but we have enjoyed them with many different types. If you would like to make the recipe spicier, try adding your favorite hot sauce or hot pepper powder into the cheese mixture! You will be pleasantly surprised! Have you ever seen or tasted an amazing chile and wished you could grow it yourself? We certainly have—and that's a huge reason Himalaya Hot began (click to learn more about our story). It is a very simple process to save your own seeds, and we want to give you the steps! You can save seeds from nearly any fresh chile pod! For best results, you will need to find a pepper that is fully ripe. Most chile peppers start growing with a green color, but then they change to another color, such as red, orange, yellow or even other more exotic colors. For example, the jalapeño pepper is usually picked while it is still green and sold that way, but if it had been allowed to stay on the plant longer, it would have eventually turned red. Seeds from most unripe chile peppers will not be mature enough to grow anything. You can also save seeds from dried chiles, and in rare occasions you can even rescue a seed from a spice mix. It will not work to save seeds from smoked chiles. It will also not usually work to save seeds from frozen chiles or any that have been preserved in liquid. 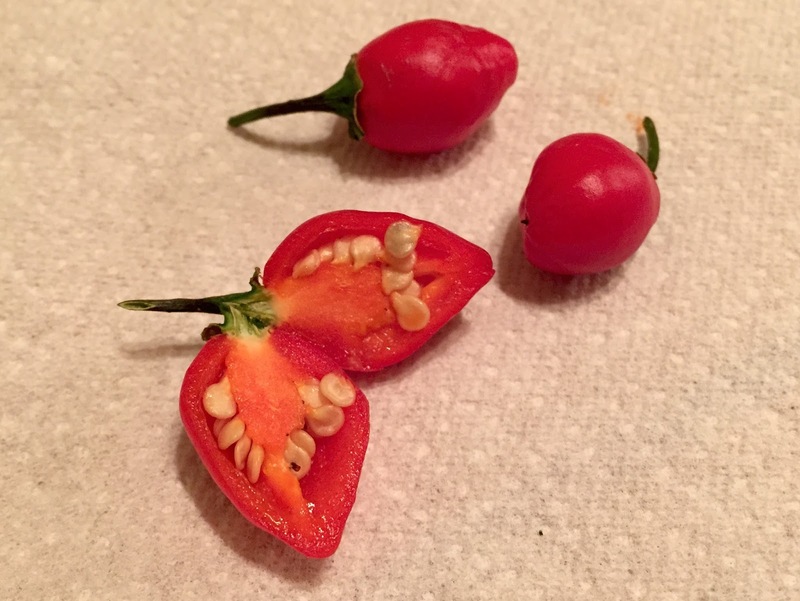 Seeds for all chiles are found on the inside of the fruit (pod). You will need to cut open the pod to get to the seeds. You can then use your knife or fingers—with gloves—to scrape the seeds out. You can immediately plant the seeds if you are ready (see our Chile Growing Guide). However, if you are not ready to plant them immediately, you will need to dry them to let most of the moisture out. Spread the seeds out on a paper plate, napkin, or newspaper and let them dry at room temperature for about 7-14 days. If this step is skipped, the seeds will rot from moisture. If the seeds can bend, they may still need more drying time. You can store the seeds in any container that is free from moisture. We use small plastic or paper envelopes. Be sure to write the name of the chile variety on the container so that you can remember what they are! Store the seeds in a cool, dry, dark place. (Refrigeration is fine, but freezing may ruin your seeds, as the small amount of moisture inside will expand and burst the delicate cells of the seed.) Properly stored seeds will remain viable for many years. We have heard reports of properly stored seeds remaining viable for 15 years. When you are ready to grow your own chiles from these seeds, check out our Complete Seed Starting and Chile Growing Guide! Please use gloves when saving seeds. We are crazy chileheads with extremely high heat tolerance, and we eat the hottest chiles in the world whole (see John eating one here). Even if you are like John and routinely eat chiles with 1,000,000+ scoville heat units, gloves are important! John has learned this the hard way many times! The first time was because he was too macho to use gloves when saving seeds from superhots, and the other times were from forgetting to bring gloves. The heat chemical in chiles can stay on your skin for a long time after you touch the seeds, and it can burn your eyes and other parts of your body. It can also burn other people you may touch. This is extremely important if you are around children or use contact lenses! Have a plan to separate and identify different varieties. If you are dedicated enough to save seeds from one kind of pepper, you will soon find yourself saving more! It is very important to have a system to separate different kinds of seeds if you are drying many at once, and it is important to also label them clearly. We recommend using very separate paper cups/plates and writing on them. There is nothing more frustrating than having "mystery" seeds because you mixed them up. Inform/warn others about your seeds. Our first time drying seeds, we had carefully arranged six different varieties to dry—and they were all extremely rare Bhutanese varieties. The next time we came in to the room, we found that someone had turned on a fan which blew all of the seeds onto the floor! It was a terrible mess, and we lost many precious seeds. So be sure to let you family and friends know not to disturb your seeds. Also be sure to warn them if there are children around. That's all it takes to save your own seeds! We hope you find this helpful! Let us know if you have any questions! If you love Bhutan as much as we do, you will definitely want to check out the free desktop calendars that are now being made available at yellow.bt! This is a new website curated by the Royal Office for Media. Each month they release a beautiful photo of Bhutan's Royal Family, along with a very convenient calendar featuring both English and Dzongkha dates. Calendars are available for all different screen sizes and resolutions, including tablets and mobile devices. We hope you'll check this out! We've been using the calendars for all of 2015, and we cannot wait for each month's calendar in 2016. It's a great conversation starter as people ask you about what is on your screen. It also is a reminder for us to pray daily for blessings on this wonderful nation and this amazing Royal Family.